The perceived notion of haves and have-nots in Major League Soccer has been quashed quickly by a club that has changed the complexion of the league in just two short seasons. 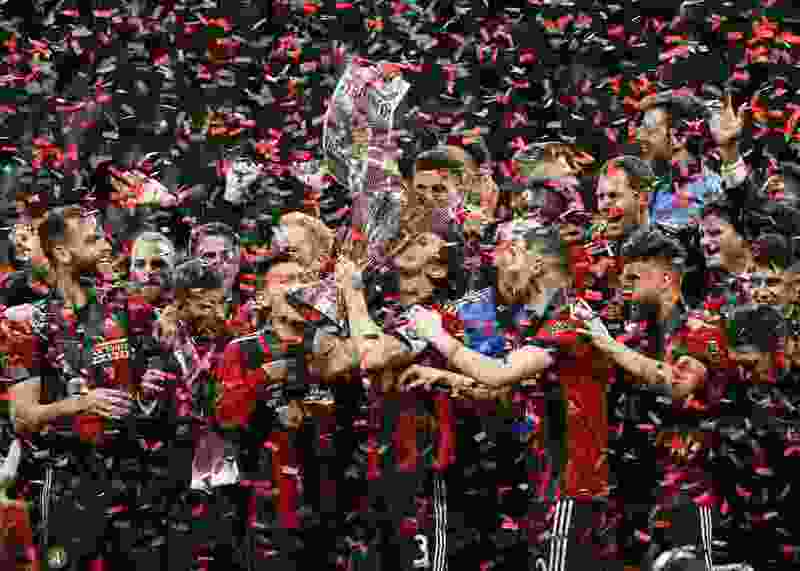 So when Atlanta United rocked Mercedes-Benz Stadium during the 2018 season, all the way to an MLS Cup final win that seemed almost pre-determined, it officially put the rest of the league on notice. Right now it’s ATL, and just about everyone else. Not that the other franchises had no idea of what was happening. It just became, you know, real. MLS is Atlanta’s league at the moment, featuring the best game-day atmosphere, most raucous and largest crowds, financial backing from an ambitious NFL owner who spares no expense, and a roster basically built to perfection for a recent expansion club. This is what everyone else faces: Atlanta sold star playmaker Miguel Almiron for $27 million to Newcastle United this offseason. To replace the league’s most dynamic player, Atlanta went to Argentina and replaced him with the reigning South American Player of the Year in former River Plate attacker Pity Martinez. The rich got richer. But does Atlanta’s construction and overall approach signal a bellwether of change throughout the league? Not necessarily. Not every owner has pockets as deep as Blank’s, so in order to dispatch the reigning MLS Cup champs, everyone else will have to now, more than ever, spend wisely specific to their team and market and build their own way. It’s absolutely doable. The New York Red Bulls have filled their roster with homegrown players in recent years and won last year’s Supporters’ Shield. Sporting Kansas City, perceived to be among the league’s smaller-market organizations, spends right and is a consistent threat out West. Real Salt Lake, like the Red Bulls and the likes of FC Dallas, has invested mightily in its academy set-up as one can tell when driving through the southwest end of the Salt Lake Valley, where the massive Zions Bank Real Academy is located. MLS is, in fact, is becoming not unlike the most renowned leagues around the world. There are the teams who decide to splash cash as much as possible, who don’t give mind to massive transfer fees or contracts, and there are teams that do it their way. It’s all relative, of course: the MLS scale remains much more modest than, say, The Premiere League. But the various approaches make the upcoming 2019 season that much more fascinating. It wouldn’t be MLS without a few annual tweaks, either. The league shortened the regular season calendar so the last week of the season is the first week of October and all MLS Cup postseason matches are one-off games. Gone are the two-leg series that dragged on a little too deep into November and December. In short, it was a long-awaited move. FC Cincinnati makes its MLS debut this year, too. Zlatan Ibrahimovic is back for his first full season in the league, so the league has its face. There will be a surprise postseason runs (see RSL in 2018) and big-name teams that falter (see Zlatan’s Galaxy in 2018). Spring is around the corner, meaning MLS is set to commence, and in this league, everyone feels like it has a shot at the postseason. How many, however, believe they have a shot at the MLS Cup, which quite likely, will run through Atlanta. While United sold Miguel Almiron — one of their best players — to Newcastle United, they brought in Gonzalo “Pity” Martinez, who just helped Argentine giant River Plate win the Copa Libertadores in South America. The biggest question of the season, though, is how their new coach, Dutch legend Frank de Boer, will run things after Gerardo “Tata” Martino left for the Mexican national team. Getting past RSL in the West semis proved to be the high point for Kansas City, which lost at home to Portland for a chance to compete for the MLS Cup. But the team, which made some key offseason additions to an already-strong group, finished on top of the conference standings last season, and there’s no reason — so far — to believe it won’t do the same this year. Although they finished just fifth in the Western Conference last season, the Timbers surged in the playoffs and made the MLS Cup Final. The team has the same core and coach, and are reportedly more fit than usual after playing a longer season. With the new playoff format in 2019, the Timbers have all the tools to finish much higher this season. Diego Valeri remains an MVP contender every year. The 2018 Supporters’ Shield winners struggled in the postseason, which has become a frustrating theme for the fan base. Red Bulls also lost star midfielder Tyler Adams, who is now at RB Leipzig in the Bundesliga. After an offseason filled with turmoil over whether or not attacking midfielder, Kaku, would move to Mexico, New York is glad he stayed put. Their play during the second half of last season propelled the Sounders all the way to the No. 2 seed. Star scorer Jordan Morris returns after missing all of 2018, but Seattle did see midfield stalwart Ozzie Alonso leave. If the Sounders make the playoffs this year, they will tie the record for the most consecutive postseason appearances in MLS (10). An expansion year in 2018 didn’t matter for LAFC, which stormed through league and secured the third seed in the West playoff race. For a team with the fifth-highest payroll last season and designs on winning the race for L.A., the team appears primed to make a run for the top spot in the conference. Wayne Rooney’s magic helped D.C. soar from the depths of the East last year to hosting a first-round playoff match. But D.C. had a rocky offseason, reportedly nearly selling attacking midfielder Luciano Acosta to PSG in France, but the deal fell through at the last minute. If D.C. has a locked-in Acosta to pair with Rooney once again, they are a threat out East. The Crew were saved. After nearly being relocated to Austin, Columbus survived the drama and now have a new shot-caller in former Toronto FC GM Tim Bezbatchenko as well as former Portland head coach Caleb Porter who takes over as coach of the Crew. Will the Crew look as potent as they did under Gregg Berhalter? Porter inherits a stable group. Zlatan is back and he said he’s going to break every meaningful record in MLS history. That’s great for L.A. and MLS, but bad for, well, everyone else. The Galaxy hired former Boca Juniors coach Guillermo Barros Schelotto, which should be a big-time pay-off considering his knowledge of the league. The Galaxy also acquired Diego Polenta and Uriel Antuna, but still have to figure out what to do with Gio Dos Santos. Gone is David Villa, who turned out to be one of the best twilight-stage Designated Player signings of all time. Villa scored 80 goals during his time in the Bronx, which will be impossible to replace this year. NYCFC signed a new DP in Romanian Alexandru Mitrita and added young U.S. midfielder Keaton Parks this offseason. Attacking depth will be a blessing and a curse for RSL, as coach Mike Petke has a lot of decisions to make at virtually every position. A miracle allowed RSL to eke into the postseason and they topped LAFC on the road and pushed Sporting KC to the limit on the road. Can offseason acquisitions Sam Johnson and Everton Luiz become starting XI regulars? One of the staples of MLS’ academy movements, FC Dallas went to, where else, but their academy to tab their next first-team head coach when former boss Oscar Pareja took over at Club Tijuana. Luchi Gonzalez is familiar with all of FC Dallas’ young guns, but will need new signings Bryan Acosta and Zdenek Ondrasek to pay immediate dividends to offset some inexperience. Can Houston be like last year and at the same time, not like last year? Their front four measures up against anyone in MLS, but the back line and midfield struggled to keep the opposition out of the back of the net, too. Houston’s outside backs DeMarcus Beasley and A.J. DeLaGarza are league staples, but also up there in age. The Union’s playoff run last year left much to be desired, as did their home form throughout the season. Philadelphia only won nine games at home, and needs to improve that mark if it wants to make any noise in the postseason this year, provided they get there. New signings Marco Fabian and Brazilian striker Sergio Santos should help. Despite having by far the highest payroll in the league, and plenty of talent, Toronto missed the playoffs by a long shot last year, after the club won MLS Cup in 2017. That was then. Now? It’s worse. Sebastian Giovinco is gone, which means TFC let go, who some argue, was the best play DP signing of all time. Jozy Altidore is still recovering from injury, too. Things change in MLS. And fast. 17. Ignacio Piatti, like Diego Valeri, is a MVP-caliber player every season and, like Valeri, can carry a team on his back. Piatti’s done that a lot in recent years. But the Impact don’t have much star power on this roster. They acquired goal-scorer Maxi Urruti from FC Dallas, but after that? Where do the goals come from? The Revs believe they’ve added the necessary firepower up front to contend in the East. They spent on Colombian striker Juan Fernando Caicedo and Spanish attacking midfielder Carles Gil. Is it enough? New England saw the exits of long-time team staples like Kelyn Rowe and Chris Tierney this offseason. Who steps up as a leader? Legend Tim Howard is hanging up the boots and gloves at the end of the year. Could the Rapids be in postseason contention come fall? Colorado, after several terrible offseasons, went out and acquired MLS-proven talent in strikers Kei Kamara, Diego Rubio, midfielder Benny Feilhaber and defender Keegan Rosenberry. The Rapids could be a dark horse out West. No more turf. Minnesota opens up its new home, Allianz Field, this spring and has a slew of new players, including MLS vets Ozzie Alonso and Ike Opara. Darwin Quintero wowed at times in 2018 and Minnesota will need their playmaker to do so again in 2019. Alonso will be paired alongside offseason DP signing Jan Gregus. The Fire are banking on a productive season from the aging legs of Bastian Schweinsteiger, and once again, DP-level stats by forward Nemanja Nikolic and winger Aleksander Katai. Youngster Djordje Mihailovic is going to be counted upon to orchestrate a deep attack, but can the defense not bleed goals as it did in 2018? Talk about turnover. Vancouver acquired 15 new players and shipped out 21 over this offseason. The Whitecaps have a new coach in Marc dos Santos and reacquired striker Fredy Montero plus Korean midfielder Inboem Hwang. There are big-time questions along the back line, too. While 2018 proved to be an abysmal experience for the Earthquakes and their fans, they’ll have something significant to celebrate soon after the season gets underway. Chris Wondolowski needs just one goal to tie and two to break Landon Donovan’s all-time goal record of 145. But there may not be much to look forward to after that. By the numbers, Orlando was arguably the worst team in MLS last year. They allowed 74 goals, lost 15 road games and had a goal differential of minus-31 — all league-worsts. As a result, the club fired its general manager. Orlando brought in former Manchester United winger Nani, but at 32, how much speed and firepower does he have left over the course of an MLS regular season? New experiences will define Cincinnati’s 2019. They’re the lone expansion team this year, much like LAFC was the season before. Much has been made of how they built their roster, but a rabid fan base and the excitement of a second Ohio team could lift the team to some wins this season.